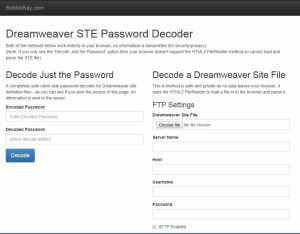 Quite regularly I need to retrieve some FTP settings and the one place I know I have them handy is in Dreamweaver (or in my repository of Dreamweaver STE files). Unfortunately Dreamweaver vaguely encrypts the password and the STE file format is XML and not intuitive. Yes I know, submitting your STE file with your websites host, username and password in isn’t exactly smart so the decoder works entirely locally (within your browser), if you’re the paranoid type, check out the source code. If you’re the really paranoid type, disconnect from the internet when you use it. It uses the HTML5 FileReader method to load the STE file in to the browser and parse there. You can keep a copy of this on your desktop if you wish, although note it has dependencies (jQuery and Bootstrap to make it look pretty). If you are a regular Dreamweaver user, I highly recommend checking out Dreamweaver CC: The Missing Manual to make sure you’re getting the most out of all of its features! Any bugs, thanks or ideas please post a comment. Saved to desktop copy does not work. I want to have a working copy of a decryptor and keep it at my Dreamweaver works page without having to search for it online. 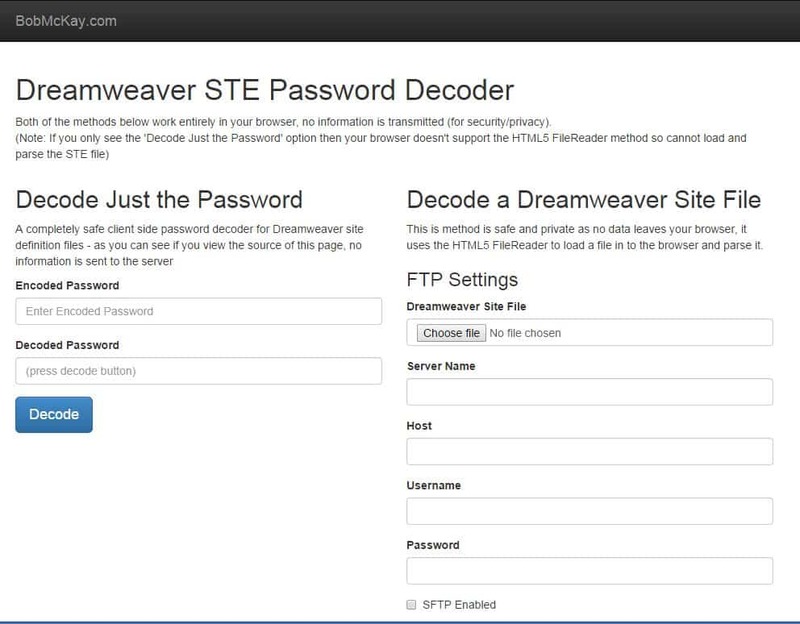 So this page http://bobmckay.com/dreamweaver-password-decoder/ works online, same page saved to desktop gives no output. sorry, not my DW works page, but works folder.